WIPL-D Starter is a low-cost version of WIPL-D professional software comprising latest release of WIPL-D Pro with 1,000 unknowns included and WIPL-D Microwave Pro. The Starter version can be purchased on a permanent bases or the software can be rented. In both cases the operation of the Starter version is licensed through a dedicated USB hard key. For all WIPL-D Lite users, an upgrade to WIPL‑D Starter is available for the reduced price. Please contact our Sales department for more info on prices and the available upgrade options. 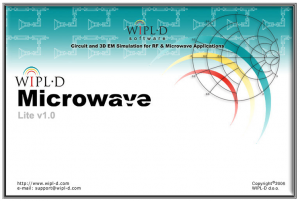 WIPL-D Lite was a limited, low cost version of WIPL-D Microwave Pro which performed analysis of projects up to 665 unknowns. It included version 6.0 of WIPL-D Pro and Optimizer Lite (optimization for max 2 variables is supported), and it was distributed by Artech House. Limitations of this version are described in this pdf. Please note that WIPL-D Lite is no longer available for purchase via Artech House. For more info, please contact us. Free 30-day trial of our latest release is available for download upon registration. More info can be found here.